Donald K. Henson thought he was honoring his daughter and his love of comics by naming his daughter after Batman's girlfriend, Jezebel Jet. "I thought she was cool!" Said Henson. "She's a former supermodel and the leader of a country! Plus Grant Morrison created the character! He's like a god on Earth! I thought I couldn't lose!" After signing the birth certificate naming his daughter Jezebel Jet Henson, the latest issue of Batman revealed that Jezebel Jet was really a member of the Black Hand, a secret organization dedicated to killing Batman. At the end of the issue, Batman appears to have died in a helicopter crash. Stella Henson was not pleased. "After I read about it in the newspaper, I screamed," Said Stella Henson. "How could he name our daughter after someone who helped kill Batman? He might as well have named our daughter Joker Bane Henson! I thought labor was painful. There's nothing more painful than realizing that your husband is an idiot!" The next day, Henson hired a lawyer to sue DC Comics. 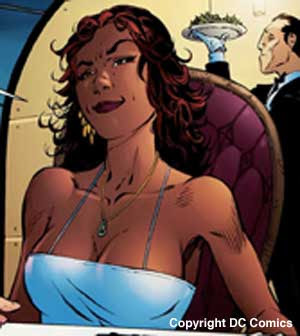 The suit will seek $100 million dollars from DC comics to cover the cost of changing her name; potential mental anguish if anyone ever found out her name was Jezebel Jet, and any other unspecified damages the Hensons may suffer at a later date. "I trusted DC comics!" Said Henson. "I trusted them when they killed off the Flash. I trusted them when they rebooted Superman. I trusted them when they made Hal Jordan a bad guy! How could DC comics do this to me?" DC Comics refused to speak on the record though one anonymous employee did speak to The Babbler. "This storyline has been nothing but trouble!" He said. "All we wanted was a story that would allow us to replace Bruce Wayne as Batman. Because Christian Bale can't play him forever, you know. Anyway, when Grant shouted, 'I'm bringing back Bat-Mite!' I knew this wasn't going to turn out well." The Babbler reached someone who claimed to be Grant Morrison. He said he had no sympathy for the Hensons. "What idiot would name their daughter Jezebel?" He asked. "Don't people read the Bible any more? I thought I was making it perfectly obvious she was a villain. I mean, this isn't The Invisibles. It's Batman!" After making some bubbling sounds, he continued, "I'm sorry. I'm working on Wonder Woman right now. Oh wow! I finally get it!" After a loud crash, he stopped replying to The Babbler's questions.